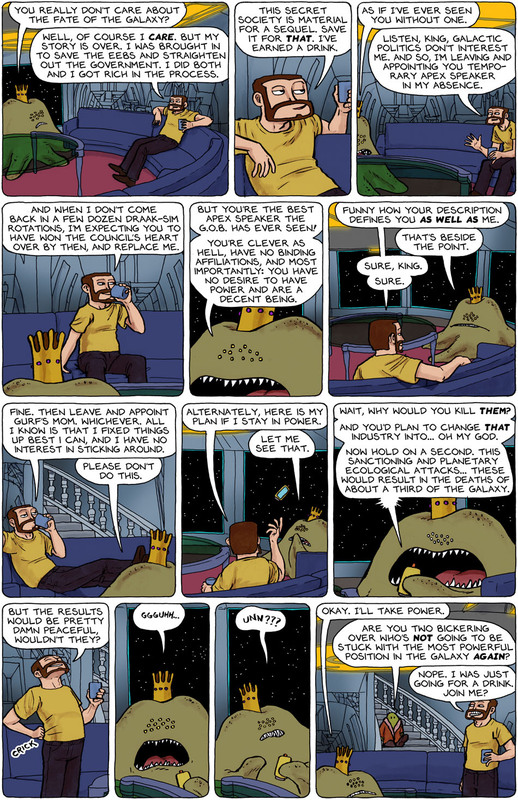 If you’re interested in reading a REALLY GOOD and interesting synopsis of Spacetrawler for the uninitiated, Robynne Blume wrote an excellent one in her blog of Webcomics Worth Wreading. Thanks, Robynne! Can I just say? I’ve been listening to “Harry Potter and the Methods of Rationality” for a couple weeks now and been unable to turn it off. I like the characters from Rowling’s book, and have really enjoyed seeing them turned on their heads in this fan-fic, not to mention that it shows in a way a more realistic approach to a bright scientific-minded person entering Hogwarts. As they say in the prologue “All science mentioned is real science.” And it’s fun. And kind of evil. How odd. Here’s the text Harry Potter and the Methods of Rationality and here’s the podcast (which is quite listenable) podcast. Dimitri; MY kind of leader! A superb bit of writing. I like this page a great deal as it has set up the whole point of the last few pages that I had thought was just going nowhere and wasting time. Great position to write yourself into there. Dimitri for the WIN! … as in he is making sure that he is no longer competing so as to not loose, and that’s a win in anyone’s books. Not much can faze King. Makes one wonder what the details were. Should “This sanctioning AND planetary ecological attacks” be “This sanctioning OF planetary ecological attacks”? Be warned: HPMoR is not being updated regularly now, so there’s a big pacing whiplash if you read through at normal speed. For that King panel, I think what you’re looking for is: “This sanction and these planetary ecological attacks . . . or “These sanctions . . .”. 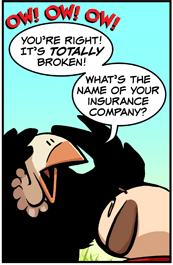 Ooh, watch out for the fourth wall in the second panel there, Dimitri! @Tim_McCormack, I suspected that but have been in denial. I’m on chapter 76 of 86. Soon it’ll be back to scrambling for stuff to listen to. I think sanctioning AND planetary ecological attacks is correct. One is a judgment, the other a following punishment. Still pretty harsh. No, Red-9, they aren’t arguing about it anymore. I think Dimitri just won. Somehow I doubt Dimitri was actually planning to kill off a third of the galaxy. What with him not being pure evil and all. @zb, he may not be pure evil, but he’s got both the genetic and cultural background to do it. The Tsars had no problem with moving entire populations around the empire. Stalin would not only move the populations but kill their children just for being related to their parents. Khrushchev starved whole sections of the country by insisting the farmers plant corn instead of wheat, and imprisoned the ones who didn’t comply. So Dimitry is just being Russian. He just proved again why he is the best and knows when to leave. If only we could do that in our world.